Which Of These Are You Most Worried About? Dark circles with tired looking eyes? A feeling that your face is travelling south? Fine lines/wrinkles/aged hands or stretch marks? Caci treatment treats every skin problem you can think of and is a brilliant antidote to late nights. It is a non-invasive procedure, combining laser light, micro current, ultrasound and vacuum, to effectively and painlessly tackle face and body imperfections. All you will feel is a mild tingling sensation.it is a simple relaxing procedure with lasting results. The treatment delivers tiny electrical impulses that mirror the body’s own natural electrical field. The impulses are delivered through slender probes for muscle re-education thereby increasing circulation and the production of collagen and elastin. This results in an enhanced penetration of the active ingredients of skin care formulations. Based on a consultation with the Dr Geeta Mehra, a course of treatments will be recommended to suit your needs. Acne/Blemish/Pigmentation/Scars/Spotty Back – Specially designed to encourage rapid healing and skin regeneration, it acts as a decongestant to problem skin. The ultrasound treatment deep cleanses and exfoliates problem areas. The laser stimulates tissue repair and spots and blemishes are zapped within a few sessions. Dark Circles and tired looking eyes – Ultrasound and blue light therapy are used to remove dead skin cells. The circulation procedure improves congestions and rehydrates, together working as a definitive healing treatment. A course of treatment dramatically reduces wrinkles, smoothens fine lines, and puffy eye bags and dark circles are visibly diminished. Stretch Marks and Cellulite – Wave good bye to the orange peel thighs with the electro cellulite treatment. Electrical stimulation breaks down fatty deposits, lifts sagging body muscles and reduces inches. This combined with I-Lipo assisted non-invasive laser lipolysis gives the desired inch loss. Anti-aging, Fine Lines Wrinkles and Aged Hands – For an extra boost, the specialised treatment combines seven phases. It stimulates facial muscles to enhance the production of collagen and elastin , softening deep lines and wrinkles for the ultimate anti-ageing experience. 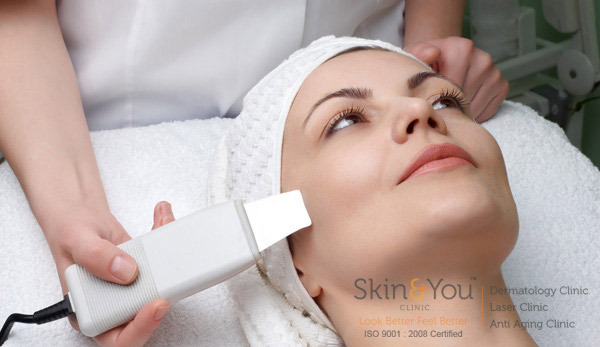 Why Skin & You Clinic for CACI Treatment? We at Skin & You Clinic are trained by professionals and have passed all due tests to conduct the procedures at our centre in Mumbai. The procedure is simple with lasting results; we at Skin & You Clinic have been trained by a team from United Kingdom, London.